Lieutenant Daniel Dodson heads the Administration Division of the Saline County Sheriff’s Office. 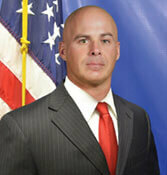 Lieutenant Dodson is responsible for managing the day-to-day “business-like” operations of the Sheriff’s Office. 11/15/2018 - Update on Telephone Scam Alert!